December 15, 1965 is the day when Karachi was in the eye of the storm. Cyclones in the month of December are rare in the north Indian ocean (Bay of Bengal and Arabian sea) but these storms are even more rare in the Arabian sea. Not much is known about this cyclone except that it killed some 10,000 people in the port city of Karachi. How did it form? what intensity it had? is extremely hard to tell since there is not much data available. Pakistan Weather Portal (PWP) will try its best to know about this storm. During the tropical season of 1965 in the north Indian ocean, a total of fourteen tropical storms formed in the ocean with twelve in the Bay of Bengal while one over central India and one over the Arabian sea, this is our cyclone. 1965 tropical season was a very busy season for this tropical basin, the activity started from May 9 and lasted till January 4. A year before, there was also an another cyclone 02A that made landfall in Tharparkar and Hyderabad district in Sindh province in Pakistan. It caused a great loss of life and property in the province. It killed 450 people and left some 400,000 people homeless. 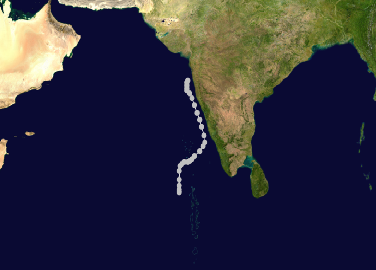 This cyclone formed near Gujarat on June 8, 1964. But PWP’s topic is 1965! This is the tropical storm that affected the Pakistani coastline as per international sources, however the exact strength of the storm is also unknown. The tropical storm formed over the unusual warm waters of the Arabian sea on December 5, 1965 over east-south-east Arabian sea. In the days ahead it moved in a complete northerly direction. On December 8, the storm moved closer to Kerala coast but started to move along the coast of India and reached Gujarat-Maharashtra coast on December 12 where the American Navy declares that the storm had lost its tropical storm status. The Navy did not follow the storm soon after the cyclone lost its tropical strength as shown in the below picture. But it is here the story takes a twist because according to the International Emergency Disaster Management, Inc the storm killed some 10,000 people in Karachi on December 15 as it made landfall over the city, three days after dissipation according to the American Navy. Was it a remnant low pressure? 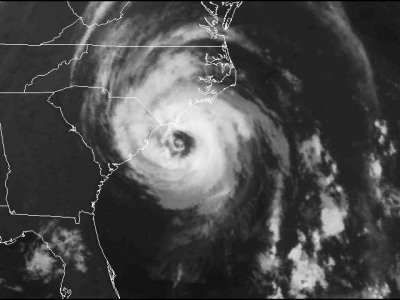 The remnants of Hurricane Cleo dropped 10 inches of rainfall on the Virginia coast in 1964. Virginia beach tallied a 24-hour rainfall of 13.70 inches. The remnants of Hurricane Camille on August 19, 1969 dumped some 27 inches of rainfall in about five hours on the part of Nelson country. Deadly flash floods and mudslides resulted from the epic deluge. The storm killed some 150 people in the state. Listening to different people’s story about this storm, some suggest that warning bells were placed on that day on the beach and the Pakistani Army evacuated the coastline within minutes and later in the day cyclone slammed the coast of Karachi with sea roaring towards the land. More details regarding about rainfall, winds and sea pressure are not available . According to the Natural Disaster Management Agency of Pakistan (NDMA) it was a Windstorm, not a cyclone that lashed southern Pakistan on December 15, a totally different view but they also agree that 10,000 people were killed on that very day. ← Cold wave takes its toll! Please let us know more about the history of this 1965 Karachi storm. Also give citations with your article. The death figure was taken from NDMA and Wikipedia. Will provide references in the future. babar bhai when will the severe cold wave end in risalpur?